This design is my first and the result of endless hours spent before a computer learning the relationship between curves on a flat 2D screen to the curves in a 3D model. I had tried several 3D computer modeling programs that I downloaded from the internet, but none of them could give me the 2D printout that I needed for constructing the 3D model and then scaling up to full sized panels for layout on 2D plywood sheets. I wanted to design a boat that could be built anywhere in the world where plywood could be found and not require any kind of mold or backbone frame to be built first. 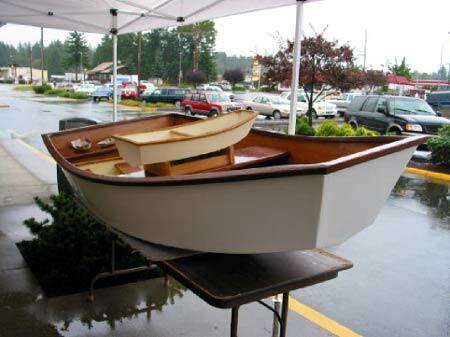 If you can't find the epoxy and fiberglass tapes and cloth in the back waters of the world; all the non-wood stuff to make one boat will fit in a cubic foot and you could carry it with you. 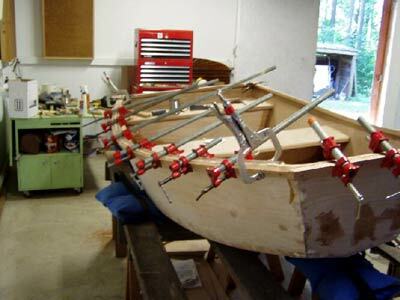 It had to be stitch and glue and easy enough to layout and construct so you could do it on the bow of your boat, dock, or beach, and mostly without power tools. 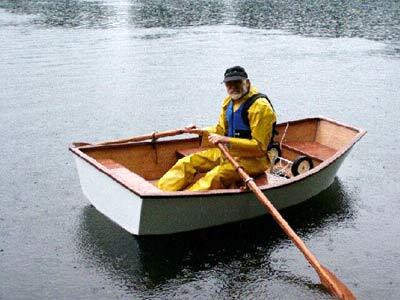 The boat also had to perform in adverse conditions, overloaded, and powered by oars. I wanted to give the boat enough freeboard to keep it from being swamped in waves, but not so high that they would act as sails. Enough width for stability, but not become a pig to row. Enough Vee in the bottom so it would track well and not waste the rowers energy keeping it in a straight line, and with plenty of arc in the keel and chines to give it strength. I wanted a pram, so the most volume could be put in the shortest length, and I wanted enough Vee above the waterline in the bow to help it cut through the water. Most of all I wanted it to look good. Form is a function, and my motto is "stitch and glue and stylish too". Once I had an idea of what I wanted, my routine became, design for hours on a vector drawing program, print it out, glue it to some cardboard, cut out the pieces, and put the hull panels back together again with masking tape. Then figure out what went wrong with that design and do it all over again. I ran out of cardboard and was checking the recycle bins, and begging my close friends and neighbors for any cereal boxes they had. Finally after 15+ attempts, things started to come together. It only took another 10+ rounds on the keel lines to complete the design as a finished model. Then scale it up to a 4 inch equals 1 foot model for error checking and final fit, followed by hours more of scaling up the dimensions from the plans to construct the real boat. While building the full sized boat, only one line needed to be adjusted and the finial lofting sheets corrected. Things go much quicker now and I can create a completely new design after about a dozen try's. I am very happy with the shape and fit of the boat and will not be making any changes to the design. The original boat had a side to side middle seat which was fine for one person, but the boat could not be balanced with someone in the stern seat. The design and hull #1 were changed to their current form with the fore and aft center/bow seat combination. With one person onboard, it glides along with little effort, sits high with little wetted area, and tracks straight, and weighs in at around 72 pounds. The design has been scaled up for works in progress, with lengths of 10, 12, and 14 feet. The 14 foot version has a deep, surf bashing/cutting bow and vee bottom.